There are some people who, when they crave New Mexican food, go to their favorite restaurant and order their favorite dish. Whether that’s tacos, enchiladas, or chile rellenos, they always go for what they know they will love and what will certainly satisfy their craving. But even if you do have your favorite dish, there is often a variety that you can experiment with. Take enchiladas for example. 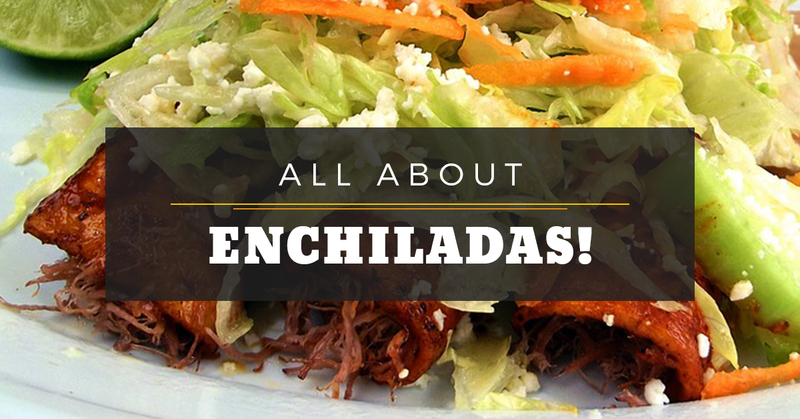 There’s enchiladas verdes, red mole enchiladas, and many more. First, what is an enchilada? 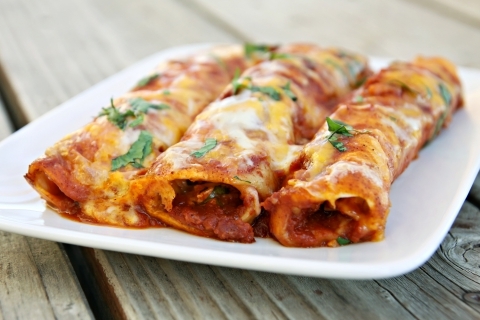 Essentially, enchiladas are tortillas stuffed with a type of meat and covered with a sauce. Types of Meat: Meat fillings often include fish, shrimp, beef, or chicken. Other Fillings: For vegetarians, there are cheese or vegetable options. Sauce: They can be topped with either salsa, a type of sauce, or beans. There is also a variety of sauces, such as mole, or a cream based sauce, which can be red, green, white, or brown. At Tortilla Flats, we recommend getting the green chile sauce — it’s amazing. Depending on the type of sauce on the enchilada, it can be called something different too, like entomatada, enmolada, encremada, etc. Enchiladas can also have different names depending on what region they are made in — enchiladas poblanas, potosinas, suizas, and more. Honduras: Locals in this country have enchilada hondureña, which are fried corn tortillas with ground beef, cheese, sauce, lettuce, and tomato. This dish to Mexicans or Americans is known as a tostada. If you want to order something similar to enchiladas in Honduras, you’ll have to ask for tacos catrachos, which are tacos covered in sauce and cheese. Guatemala: Known as enrolladas, they are corn tortillas filled with beef, potatoes, carrots, and are covered with lettuce, cilantro, and red sauce. Costa Rica: If you order an enchilada here, you’ll get something that’s closer to an empanada, which is a pastry dough filled with meat. Now that you know a little more about enchiladas and are already planning a trip to Guatemala, here are some tasty New Mexican food varieties you can look forward to trying. If you want a spicy green sauce and tasty fillings, give this variety a try. Typically this type of enchilada uses anaheim peppers and shredded chicken as a filling and they’re topped with Monterey jack cheese and queso fresco. A classic in Oaxacan, these enchiladas are packed with flavor. Using guajillo and serrano chiles, and a plethora or other ingredients, including onion, lime, herbs, garlic, and tomatoes, and filled with shredded chicken, you’ll get a mouth full of smoky flavor. This type of enchilada can be filled with either shredded chicken or chorizo and is topped with a deep red sauce made from black beans and arbol peppers. They’re topped with cheese, of course. If you’re looking for authentic New Mexican food in Santa Fe, stop by Tortilla Flats and order up a plate of enchiladas. You have a choice of yellow or blue corn tortillas, green or red chile sauce, a filling, and there’s a blend of white cheddar and jack cheese. Even though there may not be as exotic as enchilada hondureña, we can ensure that you will be satisfied. Visit us tonight for a truly authentic New Mexican experience.